Combining science-based Positive Reinforcement training methods with true knowledge of Dog Body Language, and informed by Neuroscience, I work in highly effective ways to solve behavior problems and teach you to prevent new ones from developing. And we will have fun doing it! My background in Social Work means I love working with both dogs and people. You will learn how to train your dog in a positive, supportive environment, free of judgement and criticism. I am the go-to referral for several Durham veterinarians, as well as Barnes Supply Company. I offer individual lessons, group classes, workshops, inservices and presentations in Durham, Chapel Hill, and Hillsborough. All people are welcome regardless of race, religion, nationality, gender identity or sexual orientation. All breeds are welcome, from Chihuahuas to Pit Bulls, to Great Danes. I offer a free 15 minute phone consultation to briefly discuss any issues and whether we are a good fit. 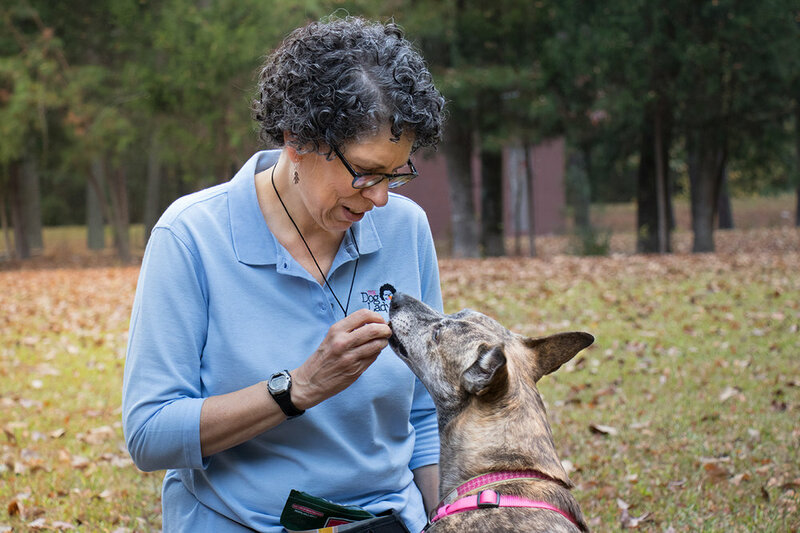 When we meet I do a thorough 1-1.5 hour assessment, including behavioral observation, health and behavioral history, and observing your dog’s movement for signs of any physical discomfort. Pain can affect behavior! After that, we discuss options for improving your dog’s behavior, which may include training, changes to the environment, and suggestions for questions to ask your veterinarian. Individual sessions focus on training and other positive techniques to improve both your dog’s behavior and your relationship. Our innovative classes include Kinderpuppy (8 weeks up to 5-6 months), Beyond Kinderpuppy for older puppies, Better Than Obedience I and II, and Kids and Dogs Training Class. See our Classes page for more information. Free hour-long workshops on a variety of dog-related topics, held at various locations in Durham. Classes held at The Dog Lady in West Durham. Skype/FaceTime consultations are available for those outside of the Durham area. I am able to take one client at a time who pays only what they can. They must have adopted a rescue dog and truly be in need of this option. Please check availability before first session.